We are SO excited to be partners with Tula SPA! Tula Spa has won "Best Spa" two years in the SW Journal, is an Organic Spa that offers Massage, Skin Care, Waxing and Eyelash Extensions... and it's only 6 blocks away! You can now add a chair massage to your Salt Cave Session for an additional $1.50 per minute (minimum of 15 minutes - this fee does not include tax or gratuity). Call Tula @ (612)244-8632 to schedule / coordinate your massage. Chair Massages are an excellent way to get to trouble areas in the back, neck, arms, and feet within a shorter amount of time. Tula's #mobilemassages vary from Swedish/relaxation, Therapeutic, Trigger Point, Deep tissue and Reflexology. The goal of adding a massage to your Salt Cave Session is that clients will feel even more quickly relaxed as they absorb all of the benefits that the Salt Cave has to offer. General Relaxation Massage (also known as Swedish Massage) involves soft, long, kneading strokes, as well as light, rhythmic, tapping strokes, on the topmost layers of muscles combined with movement of the joints. By relieving muscle tension, Swedish therapy can be both relaxing and energizing. It can also aid in recovery after an injury. This type of massage is recommended for relaxation, stress relief, and all over blood and lymph circulation improvement. The Salt Cave is a wonderful place to practice yoga, as deep breathing can help to maximize the benefits of salt therapy. Tara-Lee Bryant, founder of Peace by Piece Yoga, has been practicing and teaching yoga throughout the East Coast and Midwest since 2008. Originally trained in Hatha Yoga, Tara-Lee has continued her studies in pre-natal, vinyasa, positive meditation and pranayama techniques. 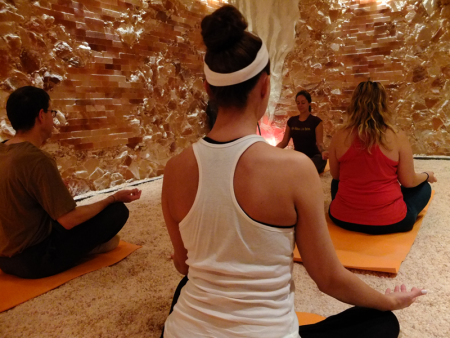 Salt Cave Yoga is currently available for private yoga sessions or you can schedule individually for the last Saturday of the month. Yoga classes costs $35 per person and we have a minimum of 5 people for a private class. Experience guided meditation in one of the most unique locations in Minnesota, led by Sara Gebeke of TrueSanctuary.com. Discover the combined benefits of meditation and salt therapy, both of which have been used for centuries to improve health and reduce stress. In combination with the benefits of salt therapy, meditation can also support increased serotonin levels in the brain and promote more clarity and creativity. Upcoming sessions include Chi Breath Meditation, which involves deep breathing while in a seated meditation as well as a moving meditation called Chi-do, and Max Meditation System, which is a practice based on a fusion of ancient techniques and modern principles of psychology and neuro-linguistic programming. The combination of the salt cave health benefits along with our Stress Rescue techniques will help restore your body and mind. You’ll receive relaxation techniques, such as breathing exercises, meditation, visualization, and chi exercises, all while detoxifying your body in the salt cave environment. Visit the BOOKING page for schedule details. We carry a unique selection of imported salts and salt-based products available for purchase. Click here to view a sampling of our inventory. 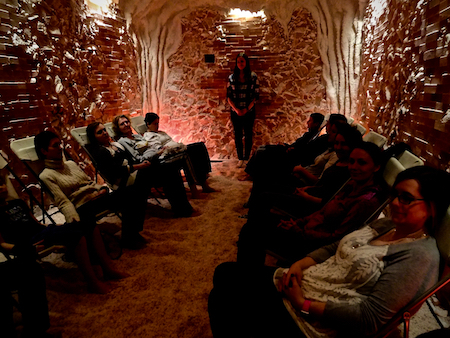 Would you like to lead a group, teach a class or host a gathering in the salt cave? Contact us for details on special services and group bookings. We offer a one-of-a-kind environment where people of any age or background can come together and enjoy the natural benefits of salt therapy.